Have you ever had a God speak to you so clearly there was no doubt it was His voice you were hearing? Has He ever used a totally random, completely unlikely source through which to do it? How about a pair of water-wrinkled feet with chipped nail polish?? 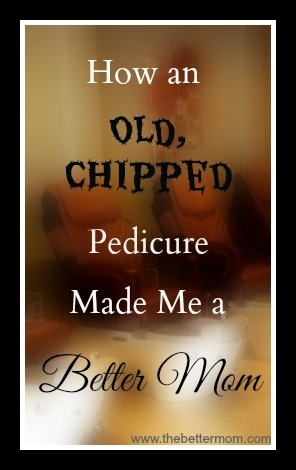 Join me at The Better Mom today as I share How An Old, Chipped Pedicure Made Me a Better Mom! What unlikely ways has God spoken to you? If you’ve just clicked over from The Better Mom, I want to extend a warm welcome to you. I do hope you’ll stay awhile and make yourself at home!